Tottenham moved back into the Premier League top four as goals from Serge Aurier and the in-form Son Heung-min helped them to victory over a stubborn Brighton at Wembley. 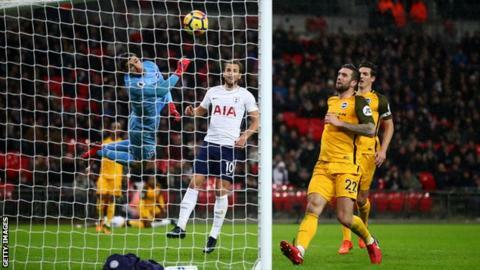 Spurs dominated both territory and possession from the start but had been frustrated by the visitors until Aurier's cross from the right touchline fortuitously looped over Mat Ryan and into the far top corner of the net to give the Ivory Coast full-back his first goal for the club. It was a harsh way to concede for Albion, who had put in a well-organised defensive display in pursuit of a first win in six matches and a first away goal against a side above them in the table. They failed to find either during the second half and their challenge was ended when Son scored for the fourth game running via a stooping header from Christian Eriksen's free-kick. Erik Lamela - making his first start in over a year following serious hip injury - struck the post with a shot, as did Harry Kane from a free-kick as Spurs claimed a second successive win to move above Liverpool, Burnley and Arsenal. Brighton remain 13th in the table, but the gap between them and the bottom three has been cut to three points. Tottenham dropped eight points in their four Premier League games in November - a run of form that dumped them out of the qualification places for the Champions League just as their results in Europe's premier club competition were hitting new heights. They began the month with an impressive victory over reigning European champions Real Madrid and won at Borussia Dortmund between their league defeat at Arsenal and home draw with West Brom. Manager Mauricio Pochettino suggested a "lack of focus", brought about by their achievements in Europe, had distracted them from their domestic responsibilities, but two wins in five days suggests they are back on target. Pochettino made four changes to his side - including dropping Dele Alli to the bench - and they had to show greater patience in this encounter than on Saturday when Stoke capitulated to a 5-1 defeat at Wembley. After an uninspiring first 40 minutes of few chances, and with the home side's patience threatening to turn to frustration, they were given a slice of luck through Aurier's opener. However, unlike at the weekend, the floodgates failed to open after the break and Spurs were forced to battle for their three points - a task to which they were equal. They did not panic when chances came and went and were rewarded when Son claimed his eighth goal of the season to give his side a comfortable final four minutes. These are worrying times for Brighton. Like both Newcastle and Huddersfield - the two other teams promoted from the Championship last season - the Seagulls are finding wins very hard to come by as we move towards winter. Albion are now without a win in five games, having lost the last three. Chris Hughton's side are well-organised, hard-working and determined - qualities that were again on show at Wembley - but they lack goals and the spark to create them, even with direct attacking players like Anthony Knockaert and Jose Izquierdo, both of whom were recalled to the starting XI. They have attempted 142 shots so far this season - the fewest of any team in the top flight - and have converted just 14 of them in 17 games. Their one and only clear opportunity to score on Wednesday fell to Tomer Hemed - in for Glenn Murray up front - but he fired his snap-shot from inside the box straight at Hugo Lloris. Albion have now failed to score a goal in the six away games they have played against sides currently above them in the league, a group that threatens to grow in number week by week. Tottenham manager Mauricio Pochettino: "I think it's fantastic for us, three victories in a row (in all competitions) - so important for us. I'm happy with the performance. On Aurier's goal: "I think he tried to put the ball in there and I think it's fantastic, sometimes you need some luck to score. "The team deserved it, we dominated the game. We deserved to go to half time winning the game, (the win was important to) believe and fight for the Premier League. We created a lot of chances, it's not easy to play when the opponent play in that formation to try only to stop you to play." Brighton manager Chris Hughton: "We were always going to be up against it here, with the quality they've got. We went behind to a very fortuitous goal and then we had really good periods in the second half. "When you're a side like us the chances are going to be minimal, you've got to defend well and I thought for large parts of the game we did that. We've gone down to a poor goal from our point of view. What the lad will say, whether he meant it or not? From our side it looks like a cross that's gone in at the far post." After failing to win any of their first three Premier League home games this season, Spurs have won five of their last six at Wembley (D1). Serge Aurier became the first Ivorian to score a Premier League goal for Spurs - they've now had players from nine different African nations score for them, the joint-most in the competition (level with Sunderland). Indeed, Spurs have now had players of 41 different nationalities score in the Premier League for them - a joint-high with Manchester City. Christian Eriksen provided his 42nd Premier League assist - second only to Mesut Ozil (47) since his debut in the competition (in September 2013). Brighton are only the second of the 27 different teams that Harry Kane has faced without scoring in the Premier League (also Cardiff). Brighton host Burnley in the Premier League at 15:00 GMT this Saturday. Tottenham are in action in the evening when they travel to unbeaten league-leaders Manchester City for a 17:30 kick-off. Match ends, Tottenham Hotspur 2, Brighton and Hove Albion 0. Second Half ends, Tottenham Hotspur 2, Brighton and Hove Albion 0. Substitution, Tottenham Hotspur. Ben Davies replaces Son Heung-Min. Goal! Tottenham Hotspur 2, Brighton and Hove Albion 0. Son Heung-Min (Tottenham Hotspur) header from the right side of the six yard box to the top right corner. Assisted by Christian Eriksen with a cross following a set piece situation. Serge Aurier (Tottenham Hotspur) wins a free kick on the right wing. Corner, Tottenham Hotspur. Conceded by Shane Duffy. Attempt blocked. Danny Rose (Tottenham Hotspur) right footed shot from the left side of the box is blocked. Assisted by Dele Alli. Substitution, Brighton and Hove Albion. Pascal Groß replaces Beram Kayal. Attempt missed. Dele Alli (Tottenham Hotspur) right footed shot from outside the box is too high. Assisted by Christian Eriksen. Substitution, Tottenham Hotspur. Dele Alli replaces Erik Lamela. Attempt blocked. Harry Kane (Tottenham Hotspur) left footed shot from the left side of the box is blocked. Assisted by Erik Lamela. Offside, Brighton and Hove Albion. Anthony Knockaert tries a through ball, but Beram Kayal is caught offside. Attempt blocked. Anthony Knockaert (Brighton and Hove Albion) right footed shot from the right side of the box is blocked. Assisted by Beram Kayal. Ezequiel Schelotto (Brighton and Hove Albion) wins a free kick in the defensive half. Attempt saved. Tomer Hemed (Brighton and Hove Albion) left footed shot from the centre of the box is saved in the centre of the goal. Attempt blocked. Son Heung-Min (Tottenham Hotspur) right footed shot from outside the box is blocked. Assisted by Erik Lamela. Attempt saved. Shane Duffy (Brighton and Hove Albion) header from the centre of the box is saved in the top centre of the goal. Assisted by Ezequiel Schelotto with a cross. Corner, Brighton and Hove Albion. Conceded by Serge Aurier. Corner, Tottenham Hotspur. Conceded by Ezequiel Schelotto. Offside, Tottenham Hotspur. Harry Kane tries a through ball, but Erik Lamela is caught offside.